Washington State Horse Expo Makes a Dazzling Return to the Clark County Event Center | Clark County Live! Considered the horse enthusiast’s event of the year, the 9th Annual Washington State Horse Expo is getting ready to take over the Clark County Event Center Friday, March 1st through Sunday, March 3rd at the Clark County Event Center. This premier equine event attracts thousands of horse enthusiasts from across the Northwest featuring national experts, first-class entertainment, vendors for shopping, and lots of kid-friendly activities. This year’s line up of nationally ranked clinicians and equine celebrities are sure to not disappoint. Guests can check them out in the presentation pen or plan to attend a seminar hosted by one of the many speakers. 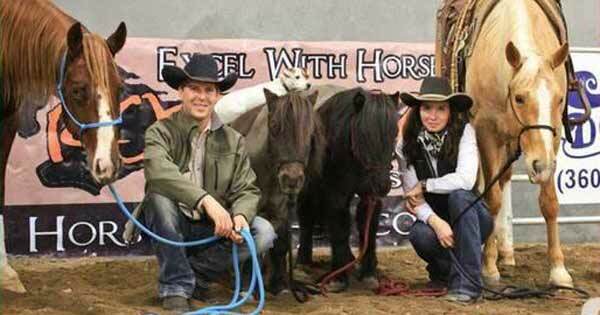 There truly is something for everyone at this one of a kind equine event. Warwick Schiller – Expo Headliner: Warwick, an Australian native, moved to the United States in 1990 at the age of 23 with a dream to become a horse trainer. He has made his name in the reining ring for the past 20 years. During this time he also learned his true passion is for teaching. He now spends his time teaching clinics across the United States, Australia, New Zealand, The United Kingdom, and Europe. Warwick also has an extensive video library of his teachings. In 2018, he took a break from his teaching to qualify and compete in his second World Equestrian Games in Tryon, North Carolina. Warwick is excited to be back in the clinician ring and is excited to present his ideas and training methods at the Washington State Horse Expo. Steve Rother: Internationally acclaimed and a local crowd favorite, Rother has competed and won many Trainers Challenges. Most notably, he is a three-time winner of the prestigious Mane Event Colt Starting Competition. Steve is known as the Horse Teacher. He is dedicated to people who teach their horses by educating themselves. Be sure to catch one of his demos and be ready to be inspired and educated. Evan Bonner: Born and raised in Port Orchard, Washington on a small farm and grew up with horses. As a young teen, he found Pat Parelli and Buck Brannaman, both great horsemen, and he knew he wanted to be one of the greats as well. Now Evan spends his days riding clients horses and teaching horsemanship clinics on the weekend. His teachings include the mechanics of proper riding and operating a horse as well as teaching people what it means to get the “feel” of a horse. Robert Eversole: Also known as “The Trail Meister”, owner of www.TrailMeister.com, the largest database of horse riding and camping areas in the U.S. It includes free trail and trailhead information, trail maps, and more for horse enthusiasts who enjoy the experience and joy of trail riding. Robert is also a registered riding instructor with PATH International, a mounted search and rescue team member, and a U.S. Marine who served on the board of the Backcountry Horsemen of Washington. Currently, Robert lives near Spoken, WA and teaches land navigation to several outdoor groups across the U.S.
Jennie Fiendish, CVT, VTS (Behavior): Jennie is a nationally recognized speaker on animal behavior and training. She is passionate about education and the promotion of scientifically based training principles and the positive impact that they make on the lives of humans and animals. Morgan Wagner and Endo: Morgan and her 17-year-old Appaloosa Endo are internationally known for their demonstration of teamwork as Endo is 100% blind. Endo suffered from painful recurrent uveitis, also known as “moon blindness” when he was 12 years old. First, he had one eye removed and then the second had to be removed. Before Endo became completely blind, Morgan began working with him. She taught him to respond to voice commands while blindfolded and asking him to move forward. He learned to trust her and they started competing in Working Equitation competitions. They now compete in the Master’s Level, the highest level achievable. Be sure to catch this duo in action. The Gypsy Chyx: A group of “Gypsy” women sharing the same love and passion for the Gypsy and Drum horse breed have become friends over the years and love to share their passion together. The Gypsy and Drum breed is a newer breed in the United States. They were first brought over from the United Kingdom in 1996. Their performance is one to catch. Dally and Spanky: The dynamic duo owned by clinician Steve Rother and his wife Francesca are back once again to dazzle us with their performances. Dally, the fiery Jack Russell, and her best friend Spanky, the miniature horse, have made appearances on the Letterman Show, won at the World Dog Awards, and been featured on National Geographic. Back by popular demand is the 2019 Saturday Night Extravaganza with clinicians and special guests in a one of a kind showcase performance. The show starts at 7:00 PM on Saturday, March 2nd. Seating opens at 6:00 PM. Admission for the show requires a separate ticket. Advanced tickets can be purchased for $8 at Wilco Farm Stores or for $10 at the door. Seating is limited, so it is recommended to purchase tickets early. Be sure to check out the Kid’s Corral! Lots of fun, family-oriented events, and attractions to check out such as “Where’s Pepa?” Kids of all ages will participate in a scavenger hunt to find images of Pepa, a PATH certified therapy horse and “living art project”, found throughout the vendor booths and entertainment areas. Kids will collect stamps from vendors (stamp cards can be found in the Activity Area) when the image of Pepa is found in their booth. Once the card is full, they can return to the activity area and receive a prize! New to the event this year will be the Youth Showcase, on Friday, March 1st at 5:00 PM. This will be a mini-extravaganza with Mounted Archery, The Tiny Trio, and Endo the Blind. Guests can participate in a “Meet the Clinicians” opportunity after the show. Friday will also be FREE ADMISSION ALL DAY for youth 15 and under. Also new this year will be an In-Hand and Mounted Event Obstacle Course Challenge. This is open to participants and spectators. The event begins on Friday afternoon, March 1st with the In-Hand portion. The event will challenge your skills as well as showcase your horse, mule, or mini as you both maneuver through the course. There may be obstacles you have never seen before as well as some you have. The mounted portion will take place on Saturday and Sunday. There will be different obstacles each day and three different levels to choose from. All courses will take place inside the Dr. Jack Giesy Equestrian Arena. A shoppers delight, the Marketplace at the Expo will feature multiple vendors selling items from services for your equine pleasure, plus farm equipment, educational materials, tack, accessories, clothing, home goods, and so much more. Tickets for the Expo are $11 for adults ($10 presale), $9 for Seniors and Youth 7-12 ($8 presale), and kids 6 and under are free. A three-day event pass can be purchased at participating Wilco Stores for $24. Parking is $6 (cash only). Presale tickets can be found at participating Wilco Stores. RV parking is available for $25 per night and must be reserved in advance. For more information, call the Event Center Administration Office at 360-397-6180 or visit the Clark County Event Center online. To see a full list of events and times for the Expo, visit the Washington State Horse Expo online.